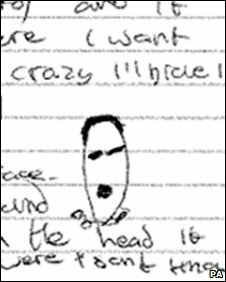 A figure with a lemon-shaped head told two boys to follow it in an apparent close encounter with aliens in Staffordshire, government files say. The figure told the boys: "We want you, come with us," according to a report from 1995 which has been released by the Ministry of Defence. The boys told police they had seen the figure in a field just before midnight on 4 May in Chasetown. However the farmer who owned the field later told police he had seen nothing. The boys had run to the police station and asked the officers to come outside and look across the distance at a glowing red saucer-shaped object. The officers thought it was an aircraft. Their report said they boys appeared "agitated and distressed" after gazing at the alleged UFO. They said it had emitted an intense heat before zig-zagging off east to west. "They stated the object was about four houses high in the sky and about 40ft away from them," said the report. "They then, reluctantly, went on to say that a voice which came from a lemon-like head, which appeared beneath the machine, said 'we want you, come with us'. "Both appeared upset and shocked and as such it was increasingly difficult to obtain detailed information from them." The police sent the boys home and told them to write up their account. One said he was drawn to the field off Rugeley Road, Burntwood, by an intense heat. He said when they walked into the field there had been a flash of light and a spaceship allegedly appeared, which had sent his friend's face "the colour of beetroot". His friend said after hearing the command to go with the lemon-headed figure, he "just said 'run'". He added: "I could hardly breathe and we turned around, it just shot off in the air and the sky didn't light up. He said the boys did not want to tell anyone because they thought they would not be believed. The report said police visited the site two days later and found a farmer spraying his crops. He said he had seen nothing unusual.